When it comes to cradles of agriculture, West Africa does not often get a look in. The Sahel is better known as a place of famine than of feasting, but it wasn’t always so, and even today the Bamana people of Mali have a rich food culture. 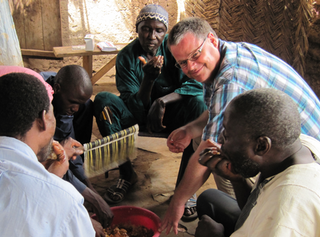 Stephen Wooten – that’s him in the picture enjoying a meal with his friends and collaborators – is an anthropologist who has been working in Mali since the early 1990s. He gave a great talk at this year’s Amsterdam Symposium on the History of Food, after which we had a chance to talk about food in Mali and how it evolved from gathering and hunting through herding cattle and sheep to settled agriculture, along the way domesticating some important cereals such as millet. There’s a lot more to the food culture though. Women and men work separately but together to ensure that the community can eat, with a strict division of labour and equally strict sharing of responsibilities. The banner photograph, by Stephen Wooten, shows the antelope headdress worn by dancers in the Ciwara performance, a celebration that recounts the mythical origins of Bamana agriculture and that, like Bamana food culture, requires the participation of women and men.